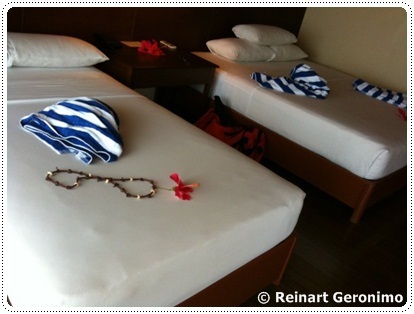 Heading for Palawan island and want to splurge at a resort? My two cousins (Andros and Steven) and their friends spent three nights at Dos Palmas Island Resort & Spa on Arreceffi island in Honda Bay – a 5-star hotel in Palawan. The review of Dos Palmas Resort is of Andreios Belaza, my cousin. Andros and his friends traveled to the Philippines to attend a wedding, and during their travels they stopped by Palawan island and its beautiful beaches. The main city hub or capital in Palawan island is Puerto Princesa, located southwest of Manila (the capital of the Philippines). International and domestic flights arrive and depart from the local airport in Puerto Princesa. For boat trips to islands in Honda Bay, you have to go to Santa Lourdes pier, which is a 30 minutes drive from Puerto Princesa city. For Dos Palmas resort, the island you need to get to the small and secluded island of Arreceffi. Duration: The boat trip to Arreceffi takes one hour. 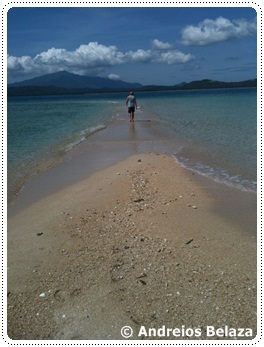 When looking for the perfect beach to relax in the Philippines, we immediately thought of Palawan island. According to locals and our families in the Philippines, Palawan was the perfect getaway for travelers who want to relax and also an opportunity to avoid the big crowds on Boracay island. 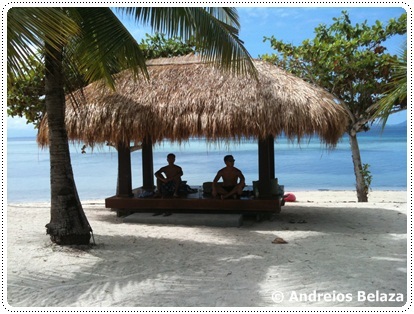 We didn't know anything of Dos Palmas Island Resort & Spa before booking. Since we were in a hurry, we just booked rooms at Dos Palmas – it was pretty much the first resort we looked at, and we decided to go for it. Spending three nights on Dos Palmas was one of the greatest chances we took! When our boat was closing up on the shores of Arreceffi island, I couldn't believe it when I laid my eyes on the beaches of this island. It was just stunning! What did this price include? Three nights at the resort, three meals a day, boat transfers and access to all sorts of activities at the resort (basketball court, ping-pong table, beach volleyball, billiards, swimming pool, library and much more). 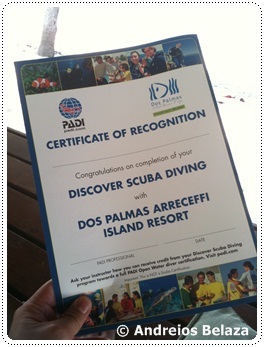 Even the Discover Scuba Diving course was included (worth 2000-2500 PHP), which I'm going to talk more about later. The only thing that wasn't included in the price was drinks! The accommodations on Dos Palmas are divided between the bungalows right on the water, and villas in their garden. We got the 2nd floor of a villa in their lush garden. Just imagine modern style and marble floors – everything in the room was very clean and neat. Our beds were comfortable and smooth to sleep in. The room had of course air-con. The guys got sick though but I don't know if it was because of the air-con or not. We met some travelers who were staying at the bungalows on the water. They told us that you can see fish swimming beneath your feet through a glass hatch in the floor – sounded awesome! The reason we chose the garden villas was the fact that we wanted privacy (we thought). After observing the tourists arriving in and out of the island, it seemed like staying at the bungalows right on the water would be noisy since tourists and travelers arrive near these bungalows when coming from Puerto Princesa. I can imagine that it can get quite noisy during the popular tourist season. The food: with three meals a day we couldn't really complain. There was a breakfast buffet in the morning, lunch at 13.00 and then dinner at 19.00. 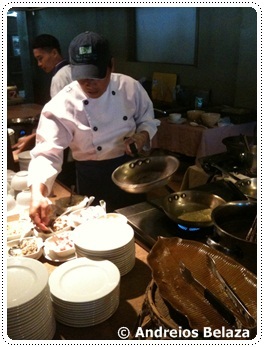 ... a sushi station, hot meals station and fresh fruit section where they can make you fresh smoothies and shakes. We won't lie - we tried it all. Filipinos don't exactly say no-thank-you to all that food. I actually gained a lot of pounds after my trip to the Philippines. Being able to sample sea dishes like crabs and giant fried shrimps, and blend it with Japanese goodies like sushi, we were in heaven. How can you spend your days on Arreceffi? As I mentioned there are a lot of activities at the resort. During the day head for the beach and relax in their mini huts - a perfect place to hide from the scorching sun. The water is clean and so clear that it's almost transparent. When we stayed there in December 2009, the water was shallow. You could walk for one minute and the water would still reach me to my calf. 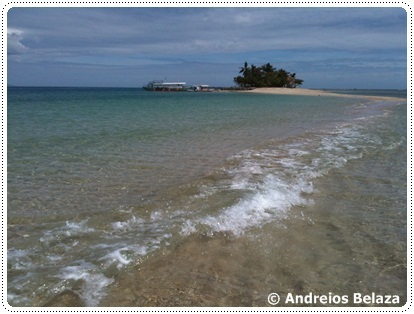 When we first arrived at Dos Palmas Palawan, we talked to some of the staff who asked why we chose Arreceffi. They were curious because they meant that many young tourists go to Boracay (all the partying is there). Well, we were not there for the nightlife. We just wanted to relax after a big wedding celebration we attended in Tagaytay. So, Dos Palmas is for tourists and travelers who want to relax, whether it's families, newly weds or people like us (we're in our early 30s). ... starting with diving theory and watching a video in the morning. Our dive master was a talented diver who we get to know very well! He was a Filipino who has his roots from the Marine and was now a diving instructor at Dos Palmas resort. Great guy! After the theory part we got to practice in the resort's swimming pool. The instructor was taking it step-by-step, and guiding us through breathing techniques, how to prepare the diving equipment and how to show signals under water. 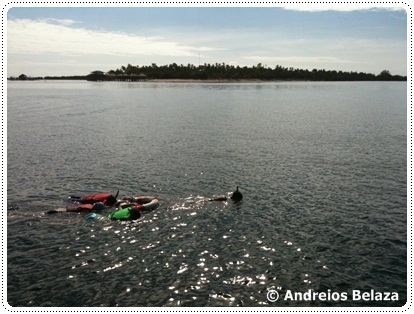 Then we took a break so we could mentally prepare for the actual diving later in the afternoon. We took the speed boat out in the open water in Honda Bay, and it was approximately 6 meters below surface. The instructor was behind us all the time, and it felt comforting and safe to know that. When we first descended I started to get a bit freaked out. But when I finally saw the underwater life, I totally forgot about it. Swimming among beautiful corals and hundreds of colorful fish, it was like being in another world. It was surreal to be able to watch humongous clams, and see them alive, and not just on your dinner plate. I got a little excited and too curious under there and touched an anemone. I got "burned" when I touched it, but I can only blame myself for that. Our instructor was very good and showed me different things hiding among the corals (I call it "things" because I'm bad at names). 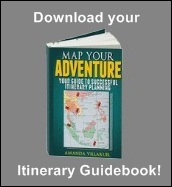 Looking for a guesthouse or hotel in the Philippines?